Persistence Market Research analyzes the global chloroacetyl chloride market over an eight year period from 2016 to 2024 in a new publication. The study demonstrates market dynamics and trends across regions that are expected to influence the current status and future prospects of the global chloroacetyl chloride market over the forecast period (2016 – 2024). The primary objective of the report is to offer information on market drivers, restraints, trends, opportunities, and value chain analysis; and updates on developments in the global chloroacetyl chloride market. The report conducts a quantitative as well as qualitative assessment of the global chloroacetyl chloride market. The report is categorically divided into three sections namely – by manufacturing process, by application, and by region; and provides a comprehensive analysis of the global chloroacetyl chloride market in terms of market volume (tons) and market value (US$ Mn). The report starts with a market overview and provides market definition and analysis of the drivers, restraints, opportunities, and key trends influencing the global chloroacetyl chloride market. Impact analysis of key growth drivers based on the weighted average model is included to better equip clients with useful decision-making insights. The subsequent sections analyze the global chloroacetyl chloride market and present a pricing analysis of the global chloroacetyl chloride market by market volume and market value across the different segments, sub-segments, and regions. For market data analysis, the report considers 2015 as the base year, with market numbers estimated for 2016 and a comprehensive forecast made for the period 2017–2024. The final section of the report presents a competitive landscape of the global chloroacetyl chloride market to provide report audiences with a dashboard view of leading market players operating in the global chloroacetyl chloride market, along with information on their market performance, SWOT analysis, and key business strategies. Some of the top market players featured in the report include CABB GmbH, Daicel Corporation, Altivia Corporation, Shiv Pharmachem Ltd., Transpek Industry Limited, Taixing Shenlong Chemical Co. Ltd., and Chengwu Chenhui Environmental Protection Technology Co. Ltd. among others. To deduce market size, the report considers various viewpoints based on secondary research. Furthermore, data points such as regional split and market split by manufacturing process and application and qualitative inputs from industry experts have been taken into consideration to arrive at suitable market estimates. The forecast presented in the report evaluates the actual revenue generated and expected revenue in the global chloroacetyl chloride market over the forecast period. The data is triangulated on the basis of different verticals, considering both supply side and demand side drivers and other key dynamics of the different regional chloroacetyl chloride markets, along with primary interviews of manufacturers and industry experts active across the global chloroacetyl chloride market value chain. The report begins by sizing up the current market, which forms the basis for forecasting how the market is anticipated to take shape during the forecast period. Given the ever-fluctuating nature of the global economy, the report presents forecasts not only in terms of CAGR, but also analyzes the global chloroacetyl chloride market on the basis of key parameters such as Year-on-Year (Y-o-Y) growth to understand market predictability and to identify the right opportunities in the global chloroacetyl chloride market. The report also analyzes the global chloroacetyl chloride market segments in terms of Basis Point Share (BPS) to understand individual segments’ relative contribution to market growth. This detailed level of information is important to identify the many trends governing the global chloroacetyl chloride market. 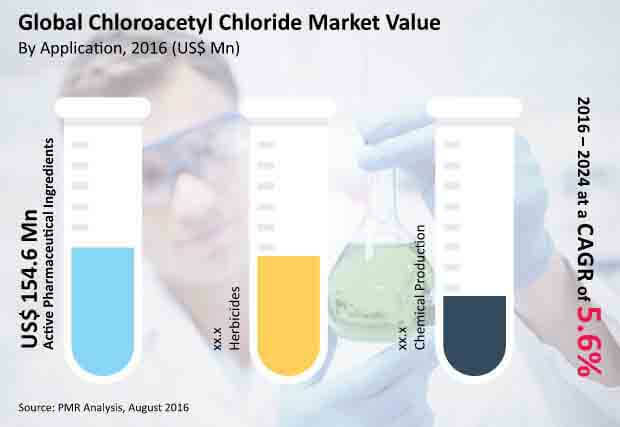 Another key feature of this report is a comprehensive analysis of the global chloroacetyl chloride market revenue forecast in terms of absolute dollar opportunity, critical in assessing the level of opportunity that a provider can look to achieve, as well as to identify potential resources from a sales perspective in the global chloroacetyl chloride market. In order to understand key growth segments in terms of growth and performance in the global chloroacetyl chloride market, Persistence Market Research has also developed a market attractiveness index to help providers identify real market opportunities in the global chloroacetyl chloride market. Chloroacetyl chloride, a colorless to yellow liquid, is a bi-functional compound that is useful as a chemical building block. This chemical is mainly used in the production of herbicides, in the formulation of active pharmaceutical ingredients, and in the production of other useful chemicals. The global chloroacetyl chloride market was valued at US$ 382.9 Mn in 2015 and is anticipated to register a CAGR of 5.6% in terms of value over the forecast period (2016–2024). The main use of chloroacetyl chloride is in the manufacturing of herbicides used in agriculture. Especially, popular herbicides such as alachlor and butachlor are manufactured using chloroacetyl chloride. However, due to the fact that such herbicides create environmental pollution, production and use of alachlor and butachlor has been banned in the EU region. However, several countries in Latin America and in the Asia Pacific region continue the use of such herbicides and therefore the demand of these herbicides is steady and rising. This is expected to boost the growth of the global chloroacetyl chloride market. In case of medical emergencies, the human body is unable to produce the adrenalin hormone. Thus, demand for externally produced adrenalin is expected to increase due to an increasing risk of life threatening diseases. Chloroacetyl chloride is used in the production of epinephrine (adrenalin hormone). This is also expected to fuel the growth of the global chloroacetyl chloride market over the forecast period. However, adoption of substitutes of chloroacetyl chloride in herbicides and in active pharmaceutical ingredients can hamper the growth of the global chloroacetyl chloride market over the forecast period. On the basis of manufacturing process, the global chloroacetyl chloride market can be segmented into chlorination of acetyl chloride, oxidation of 1,1-dichloroethylene, and others. The others segment is estimated to account for 35% volume share in 2015 and is estimated to register a CAGR of 3.7% over the forecast period. The others segment is estimated to dominate the market over the forecast period. The 1,1-dichloroethylene (vinylidene chloride) segment is anticipated to lose its market share over the forecast period. This is mainly attributed to the consumption of vinylidene chloride in the polymerization process for consumer products. On the basis of application, the global chloroacetyl chloride market can be segmented into herbicides, active pharmaceutical ingredients, and chemical production. Alachlor, butachlor, and acetochlor among the chloroacetanilide family are produced from chloroacetyl chloride. These herbicides are widely used in weed control. However, banning of alachlor and butachlor in European countries is expected to hamper the growth of the chloroacetyl chloride market. However, use of chloroacetyl chloride in the production of other herbicides in the chloroacetanilide family is expected to fuel the growth of the herbicides segment over the forecast period. The active pharmaceutical ingredients segment is estimated to account for 38.4% value share and remain dominant throughout the forecast period. The chemical production segment is estimated to account for 24.4% volume share over the forecast period. On the basis of region, the global chloroacetyl chloride market has been segmented into North America, Latin America, Europe, Asia Pacific, and the Middle East & Africa. Asia Pacific dominated the market with over 40% of the overall global chloroacetyl chloride market volume share in 2015. The market in Asia Pacific is anticipated to register the highest CAGR in terms of value and volume over the forecast period. Latin America is anticipated to emerge as the most attractive region in terms of market share and CAGR during the forecast period. Some of the key players identified in the global chloroacetyl chloride market are CABB GmbH, Daicel Corporation, Altivia Corporation, Shiv Pharmachem Ltd., Transpek Industry Limited, Taixing Shenlong Chemical Co. Ltd., and Chengwu Chenhui Environmental Protection Technology Co. Ltd. among others. Top companies operating in the global chloroacetyl chloride market are focusing on enhancing their global presence by entering or expanding their footprint in a largely untapped market. Chengwu Chenhui Environmental Protection Technology Co., Ltd.